While France, Léonie and Aurore were promoting Ecotroll at Grand Pavois (boat show in La Rochelle), last week, I was on board the trimaran Northern Passage, in Canadian Arctic. Few days before, Børge Ousland called me to reinforce the crew of the Norwegian sail boat for one of the most exciting part of her journey: from Cambridge Bay to Pond Inlet, the heart of the North-West passage (look at the pictures)! 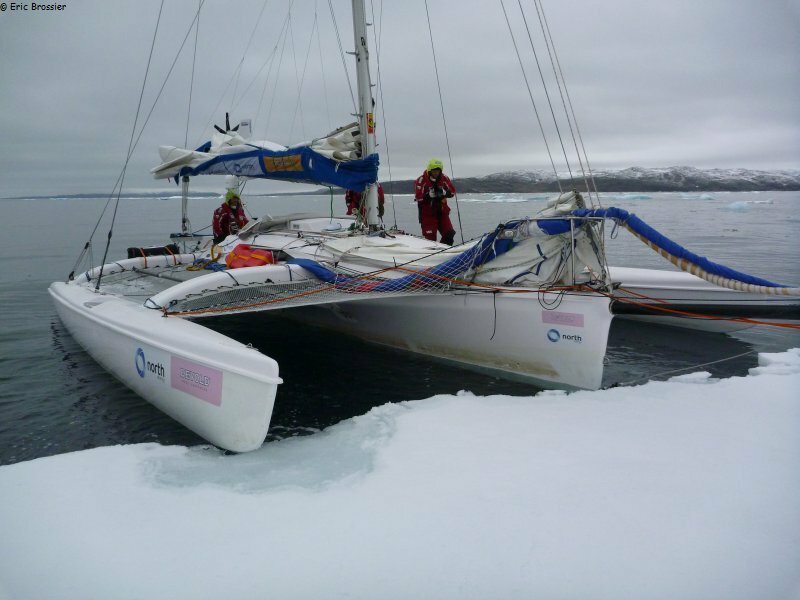 Then Trygve replaced me in Pond Inlet to cross the Atlantic, so they are still four on board the trimaran, who could become soon the first yacht to sail around the Arctic in a single season (blog). Unless the Russians on board Peter 1st manage to catch up with Norwegians! It took us 17 months, on board Vagabond, to sail both passages (2002-2003)... What a difference to sail this year through a landscape with almost no ice, where we struggled for days to avoid wintering. The Norwegian trimaran's performance will allow more focus on the disappearing multiyear ice, which doesn't mean that navigation is safe in the Arctic: a cruise ship and a tanker went aground last summer in Canadian archipelago, because of poor charts (both boats are just back sailing). To the pack ice retreat, we need to add the coming oil rush in Greenland. For sure, it will increase sea traffic in this part of the Arctic. To better understand and witness all these changes, Vagabond will set sail from Brest in about seven months for another long polar stay, supporting the scientific community. To be continued!